That didn't take long. An overnight panic in global markets evaporated as Wall Street gave an emphatic welcome to President-elect Donald Trump. The Dow soared 257 points and brushed up against lifetime highs on Wednesday, in defiance of those who predicted Trump's election would bring about a plunge in the stock market. The S&P 500 and the Nasdaq rose 1.1% apiece. The impressive market performance represents a dramatic reversal from the knee-jerk panic in global markets overnight as the results were coming in. 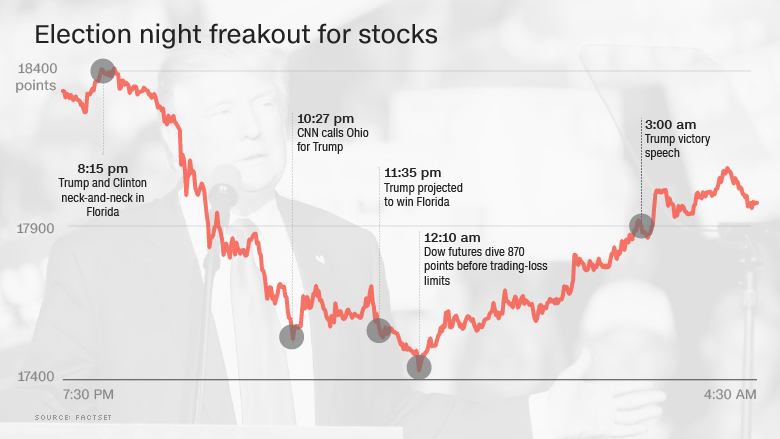 Dow futures plummeted nearly 900 points at one point as investors expressed fear that no one would emerge victorious and concern about the inherent uncertainties brought on by a Trump White House. But a sense of relative calm returned to the markets by morning. The rally gathered momentum midday after Hillary Clinton, Wall Street's favored candidate, officially conceded. 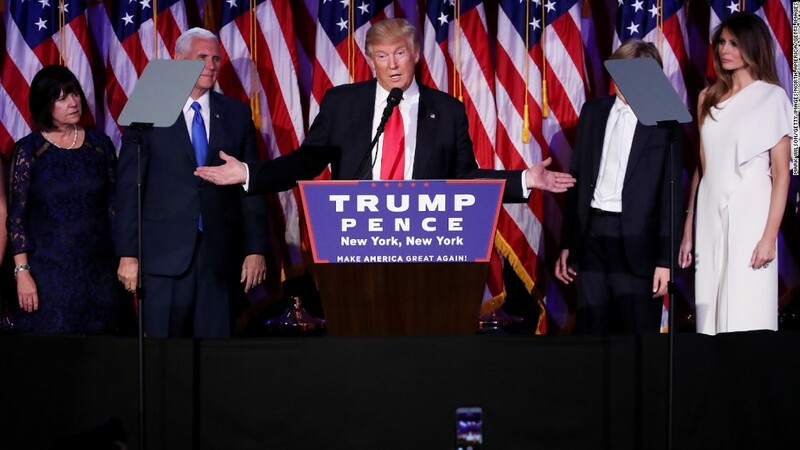 Market strategists said the upbeat mood in the markets is due in part to Trump's victory speech, which raised hopes that he will focus on policies that can help the economy and not follow through on some of his extreme campaign positions. "The selloff last night was an hysterical reaction," said David Bianco, chief U.S. equity strategist at Deutsche Bank. "There are a lot of potentially damaging policies that could be introduced, but we think sober minds will prevail." Peter Kenny, an independent market strategist, admitted that the market has "greeted Trump with a far more positive footing than I expected. He's receiving a very warm welcome." Still, it's clear that global markets are on edge. Asian stocks fell sharply, led by a 5% plunge for the Nikkei 225 in Tokyo amid concerns about how Japan's trade-centric economy would weather Trump's anti-trade rhetoric. European markets also slumped initially, before recovering and are mostly in the green now. The Mexican peso plummeted over 11% at one point to a new all-time low against the U.S. dollar. Top Mexican finance officials said they would take steps to shore up the peso, but failed to lay out concrete details. Trump's tough talk on trade with Mexico is seen as a direct threat to the Mexican economy, which depends heavily on trade with the U.S.
Gold, which tends to do well when investors are scared, surged 3% overnight. However, the precious metal eased back ended the day flat, confounding those who predicted a dramatic surge if Trump won. "This is a bit like Brexit," said Ed Yardeni, president of investment advisory Yardeni Research. "The polls indicated a victory for the status quo. Instead, the vote came out with a radical alternative scenario." Indeed, just a day before the election, the Dow had roared nearly 400 points after the FBI again cleared Clinton in the email investigation. It was the latest evidence that investors were anticipating a victory from Clinton, who represented more stability than Trump. "People were not positioned for this and that's going to have some aftershocks," said Michael Block, chief market strategist at Rhino Trading. That explains the dramatic moves for stocks that were seen as big winners or losers in a Clinton White House. For instance, Wall Street raced on Wednesday to buy up shares of biotech and prison companies -- two industries Clinton had singled out for attack. The iShares Nasdaq Biotechnology ETF (IBB)soared 9% and drug makers like Shire (SHPG) spiked 9%. Big banks are also rising amid an uptick in interest rates and on hopes that Trump will follow through with promises to dial back the Dodd-Frank regulatory reform. JPMorgan Chase (JPM) soared nearly 5% and hit a new lifetime high, while Morgan Stanley (MS) surged 7%. Of course, Trump has also called to break up the big banks by bringing back the Glass-Steagall Act. Defense stocks like Lockheed Martin (LMT) and Raytheon (RTN) are flying high as well, a sign that Wall Street is betting Trump and the GOP-led Congress will ramp up military spending. Likewise, Trump has promised to spend heavily on rebuilding America's infrastructure. That's great news for construction and materials companies like Caterpillar (CAT) and U.S. Steel (X), both of which enjoyed big market rallies. Hospital stocks plummeted amid fears Trump will scale back or even repeal Obamacare, which had provided hospitals with a steady stream of customers. Hospital operators HCA Holdings (HCA) and Tenet Healthcare (THC) plunged 11% and 25%, respectively. Yardeni said Wall Street is anxiously awaiting more clarity on Trump's policy goals, including ones like tax cuts and cutting regulation that could help the economy. He said others like tariffs, trade deals and mass deportation are "harebrained, and hopefully will be scrapped along the way." The bond markets were also experiencing volatility as Wall Street fretted about how Trump's spending programs could run up the U.S. debt load. The 10-year Treasury yield, which would normally fall during nervous times in a flight to safety, rose dramatically to a 10-month high of 2.04%. The closely-watched bond rate had been sitting at just 1.85% on Election Day. Longer-term bonds sold off even more, driving the yield of the 30-year up to 2.83%, compared with 2.58% on Election Day. In another sign of concerns about U.S. debt, Fitch warned on Wednesday that the medium-term impact of Trump's policies "would be negative" for U.S. creditworthiness if implemented in full. "The rhetoric that was talked about on the campaign trail was pretty scary. The nationalism and protectionism," said Art Hogan, chief market strategist at Wunderlich Securities. "But there's a big difference between what you say campaigning and what you do as president," Hogan said.